With unemployment still high and the creation of jobs not at the speedy pace that President Obama, Congress, or the citizens of the United States would prefer, good news from Wall Street often is not given much attention. But, that does not mean that there is not any good news in terms of the American economy. Over two years ago, the stock market crashed harder than it has since the days of the Great Depression nearly 80 years prior. The effects are still being felt on the streets and in the homes of the United States. However, on Wall Street, a recovery is very apparent. The S&P 500 is currently reporting the most significant statistics. 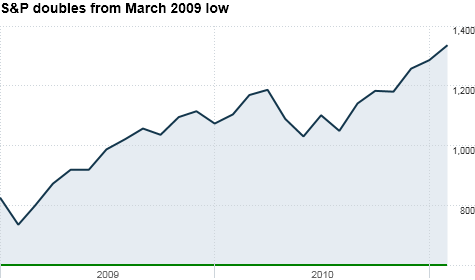 On March 6th of 2009, the S&P 500 fell to a terribly low 666.79 points. In just barely under two years since that date, the value has doubled. It is the quickest doubling in the history of the S&P 500, which began releasing statistics in 1957. It now sits at 1,336 points. The Dow Jones is also doing well. It is currently sitting at 12,288 points, the most it has seen since June of 2008. Other reports, from the government, indicate that the housing market is beginning to come back as housing starts gained 14% in January. However, building permits did fall off ten percent. While all of this news might not yet be impacting the majority of Americans in a direct way as of yet, this is definitely good news for the citizens of the United States. The resurgence of American corporations might come across to many as the big guys staying strong while the little guys such as small businesses are being left behind. But in reality, the growth of the major corporations truly means that in the long run, they will be starting more projects and expanding. In turn, that would require employees. Those employees will range from people needed to run office operations that require high levels of education to factory work and construction work, which would not require as much college or graduate school if at all. Thus, even though many tend to brush off gains in the stock market as nothing more than the government pumping money into big corporations and meaning nothing for the average American; in the long run, everyone is going to benefit from the rise of the stock market. After all, if the stock market’s growth does not mean the success of the American economy, then why did the crashes of 1929 and 2008 lead to the fall of the American economy?